Symphonic Waves continue their journey to 2020 with concert in Clonbur. The west of Ireland’s newest youth orchestra, Symphonic Waves, will give its first performance of 2018 this evening in Clonbur, Co Galway. Formed in 2017 as a project for Galway 2020 European Capital of Culture, the Symphonic Waves members are currently on a week-long residency in Petersburg Outdoor Education Centre in preparation for their first outing of the year. The performance in Clonbur is just one of the milestones for the orchestra on their journey to 2020. Other plans include international exchanges with European youth orchestras, commissioning of new work and national touring. On August 23 James Cavanagh will conduct works by Benjamin Britten, Astor Piazzolla, Peter Warlock and Irish composer TC Kelly as well as various short chamber pieces. The 58 members of the ensemble hail from Galway, Sligo, Mayo, Roscommon, Clare and Limerick and are aged between 13 and 21. Professor James Cavanagh, who is the Symphonic Waves conductor for 2018, has conducted the National Symphony Orchestra, the RTÉ Concert Orchestra, The Irish Chamber Orchestra, the National Youth Orchestra, and many other orchestras at home and abroad. This evening he will conduct works by Benjamin Britten, Astor Piazzolla, Peter Warlock and Irish composer TC Kelly, as well as various short chamber pieces. This group of young musicians also works closely with Galway Music Residency’s ConTempo Quartet, who mentor the young musicians and help them to develop their musicianship and ensemble playing. 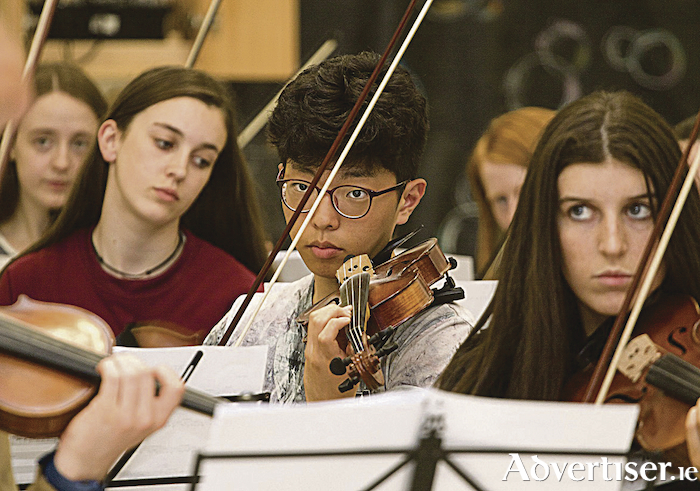 Currently a string orchestra, Symphonic Waves is expanding with brass and woodwind sections being recruited later this year. In late 2017 Galway County was announced as one of nine new music generation areas to receive philanthropic funding from U2, The Ireland Funds, and the Department of Education and Skills. The programme for Symphonic Waves is now managed and will be delivered by Music Generation Galway County, and its development officer Ruth Gordon says Music Generation Galway County is delighted to partner with Galway 2020 on Symphonic Waves. "I have experienced first-hand the enormous impact that access to the creative arts can have on children, young people and communities. Symphonic Waves offers our next generation of young musicians wonderful performance opportunities and to take their creativity to a new level." Formed in 2017, Symphonic Waves is one of the first projects from Galway 2020 European Capital of Culture. Galway 2020 programme manager, Marilyn Reddan Gaughan, says Symphonic Waves is an exciting legacy project, which brings together young talented musicians from the west of Ireland in the heart of a European Capital of Culture. "The rehearsals and opportunities being made available to these young musicians is a key part of our journey towards 2020. We can’t wait to see the performances that will form part of the Galway 2020 programme. We know they will be fantastic," she says. The orchestra came about from a collaboration involving the Galway Music Education Partnership led by Galway and Roscommon Education and Training Board (GRETB ) and Galway 2020, and included Athenry Music School, Coole Music & Arts, Headford Music Works, GTI School of Music, Galway Youth Orchestra, Maoin Cheoil na Gaillimhe, Music Matters, Galway County Council, Galway City Council. and Ealaín na Gaeltachta. The performance takes places at 8pm in Clonbur Community Centre with tickets available on the door. For more information contact [email protected] or call 091 874557. Page generated in 0.2455 seconds.